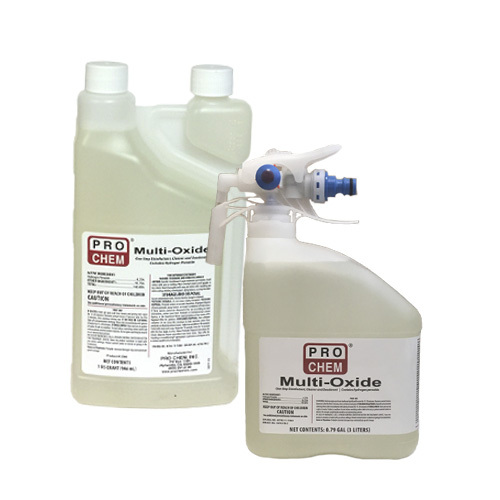 MULTI-OXIDE | Pro Chem, Inc.
MULTI-OXIDE is a one-step germicidal cleaner and deodorant. While designed for hospital use, this formula can be used in any application that requires disinfecting, sanitizing, deodorizing or cleaning. It can also be used to control mold and mildew odors on hard, nonporous surfaces. Apply using an electrostatic sprayer or a mop, sponge, cloth, paper towel, trig sprayer or auto-scrubber. Efficacy data available below. See product label for complete mixing and use directions. *Do not use on glassware, utensils or dishes. *Not recommended for use on copper, brass, granite, marble or zinc.